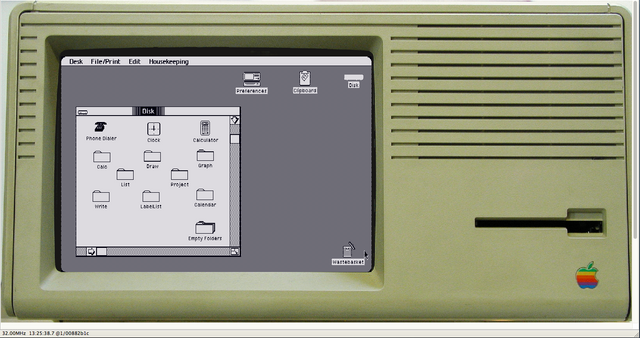 from where "Lisa OS 1.0"
Post subject: from where "Lisa OS 1.0"
I'm experimenting with Emulator LisaEm on Windows. The systems Lisa OS2 and OS3 i can install on HDD. The Mac Works XL system works from diskette. I would like to install Lisa Office System 1.0. Is there disk image for this system? Where can you download this? Post subject: Re: from where "Lisa OS 1.0"
I don´t have the CD around to confirm, right now. Many Thanks. I'll take a look and I'll report. I downloaded the files los1.0_noTools.img, los1.0_sn0010_wTools.img, t001.dc42, t008.dc42 and t017.dc42. If I want to start from t001.dc42, the error "TWIGGY READ FAILD" comes up. How do I get a bootable OfficeSystem1 under LisaEm? How could you include the files los1.0_noTools.img or los1.0_sn0010_wTools.img in LisaEm? I think that the first version of the LisaOS was for the first Lisa model, which had 2 5.25 inch drives. The model the Lisa emulator emulates is the second one, which had one 3.5 inch drive, so you can't run it. Wait until some emulator supports it or until the Lisa emulator supports it. I heard Apple is going to be releasing a Lisa emulator this year, so that will probably do the trick. Thanks for the info, adespoton! No dice with the old disk images on my side either - no surprise. Other than that LisaEm is looking good and easy enough to run.